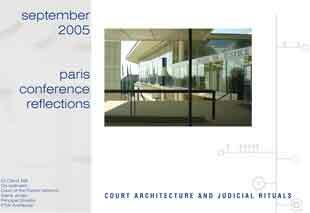 The first tour in 2005 visited memorable new French courts, including those by Jean Nouvel, Richard Rogers and Henri Cirani. One highlight was a mock trial in a special terrorism courtroom in Paris, conducted in French, English and Chinese and displaying the different court layouts used by each legal tradition. The Pontoise court illustrated contemporary principles in French court design – elegant and comfortable furniture, clear signposting, increasingly egalitarian courtrooms and plenty of natural light. 1. Justice On Trial – The mock trial session and a comparison of French, Chinese and Australian court layout. Leading Questions – Way-finding in the French court buildings. Beyond The Court – Different French court buildings have different relationships to their settings. Flexible Futures – Adaptation of court spaces to changed purposes. New Symbolism – The presence and absence of symbols of authority in the courts. Feeling Secure – Safe spaces created by architecture. The use of glass enclosures or cages in terrorism cases. 3. Advanced Technology – Old courtrooms adjust to new technologies, new courtrooms design it in at the outset. 4. A Hushed Place – A reflection on the Cour de cassation of the Palais de Justice in Paris, and the Thirteenth Court of the Supreme Court of Victoria, Melbourne. 5. A New Court For Paris – Construction of the new Paris courts complex.